Fort Lauderdale associate Deedee Bitran participated as a panelist during The Stonewall Legal Alliance’s “Discrimination in the Workplace” panel at the FIU College of Law. The panel was hosted by FIU Law’s Stonewall Legal Alliance, Women’s Law Society, and the American Civil Liberties Union. The Stonewall Legal Alliance is a social and political organization designed to raise awareness of gay and lesbian issues. The panel discussed employment law, immigration law, and cutting-edge discrimination issues in the workplace. 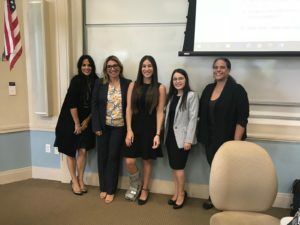 FIU Law students were given the opportunity to ask questions relating to the job interview process and learn more about discrimination in the workforce. Deedee (center) is pictured here with Professor Kerri Stone, Andrea Canona of Andrade Canona, LLC, Sahara Fonseca (Vice President of Stonewall Legal Alliance), and Professor Michele Anglade. Alamea Deedee Bitran is an attorney in the Fort Lauderdale office of Shutts & Bowen, where she is a member of the Business Litigation Practice Group. Deedee represents employers, business owners and developers. While in law school, she served as a Judicial Intern to the Honorable Ivan F. Fernandez in the Third District Court of Appeal and as an Articles Editor on the FIU Law Review. She also served as a Legal Research Assistant to Professor Kerri Stone, where she researched and contributed to articles on employment discrimination and harassment.